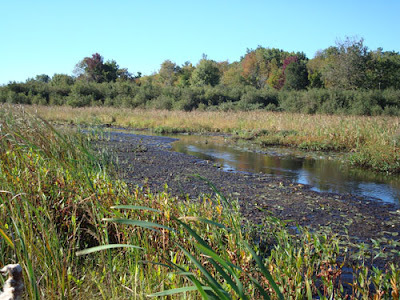 I have now begun searching Roselle Park and Hofma Park, in part just to scout the habitat. Michigan is very dry right now, and many areas which might in other years be wet are dried up. 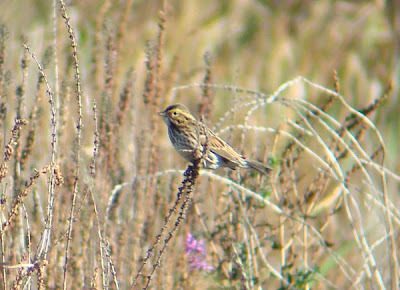 This may be bad for my Sharp-tailed Sparrows, as Alan Wormington reported they prefer marshes/fields with 2-10 inches of water at Hillman Marsh, Ont. 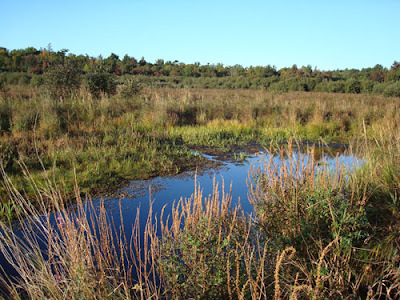 However, the species is also known from dry weedy fields during migration, and I can envision a bird which puts down in one of these areas to choose the dry fields as the best available habitat at that moment. Today I went to Hofma Park in Grand Haven and walked north along the main channel's weedy edges, and was very impressed with the habitat. It was wettest right along the edge of the channel, and much drier as you headed away from the channel, but the dominant plants were grassy, tall, and very tough to walk through- presumably good for my bird. Swamp Sparrow Sedge Wren Savannah Sparrow Song Sparrow All of these birds were flushing because of my presence, briefly perching up where I could see them, then retreating out of sight. 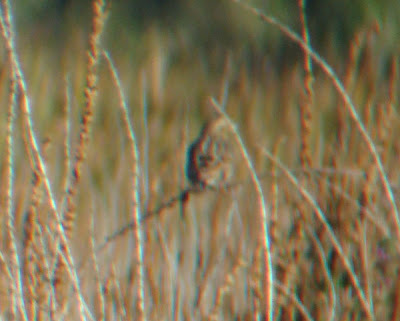 This allowed me to get a feel for each of these species in flight- Song and Swamp Sparrows being large, dark, and long-tailed, Sedge Wren being very small with light orange rump and weak flight, and Savannah having paler overall coloration and shorter tail. Toward the end of the morning, I flushed a small sparrow which immediately seemed odd: short tail and obvious pale yellowish braces on the mantle, and a paler overall coloration all over the upperparts. It landed briefly, allowing me to see a pale yellow (off-white) supercilium and other facial background features (not the ochre of adult Le Conte's but paler). 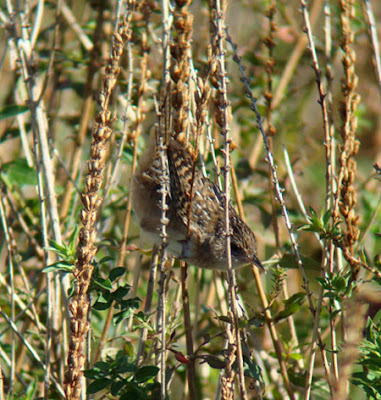 The mantle was clearly "scaly" like an adult Grasshopper Sparrow or Baird's Sparrow. I never saw the underparts. Here are my best shots, which unfortunately are all out of focus slightly: I do not know which species this is, but I can say it was not the following: adult Le Conte's, adult Nelson's Sharp-tailed, adult Henslow's, Savannah. Perhaps it was a juvenile Le Conte's or juvenile Henslow's, or perhaps a Grasshopper of unknown age. 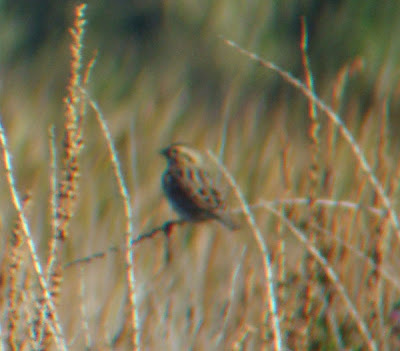 I do not think this is a juvenile Nelson's Sharp-tailed either, as they apparently lose this plumage by Sept (Sibley 2000) and are typically very ochre-yellow throughout the entire plumage. Juvenile Le Conte's hold this plumage until November (Sibley 2000), so they must migrate in it. I will continue to update the progress of my search. 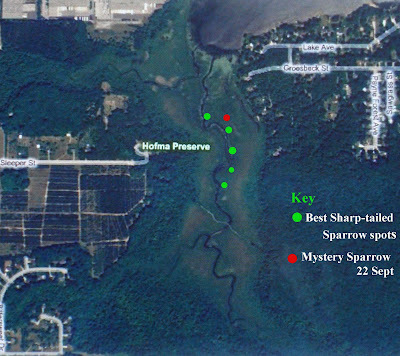 I intend to do a kayak search of St. Clair Flats next Saturday, and given the extent of the habitat there (huge!) and the presence of water, I think there's a decent chance we may succeed. Did you ever I.D. the mystery bird. 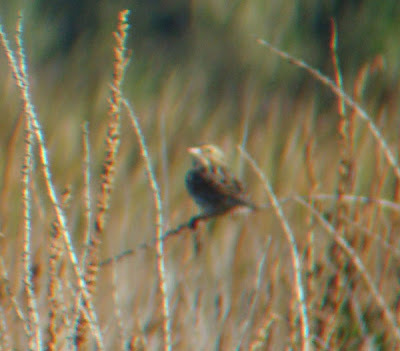 I am pretty sure it is a Henslow's Sparrow. 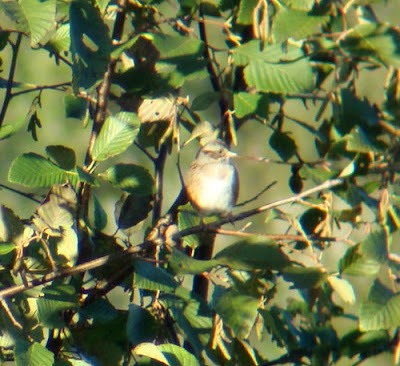 The greenish face, large mark behind eye, and large bill seem right on as does the back pattern and short tail and overal body shape. Why is this species ruled out? 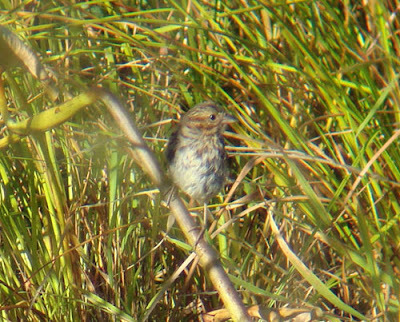 I didn't ID it, but one Le Conte's Sparrow expert (has handled thousands) feels certain it is a young Le Conte's Sparrow. I agree with you that Henslow's is tough to rule out, esp. a juvenile, of which I have never seen and am not totally clear what it looks like!